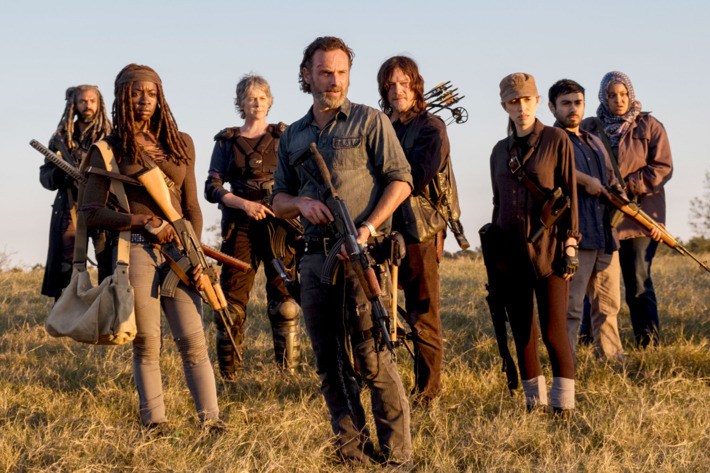 'The Walking Dead' Season 9: What Can We Expect? With significant changes in production, the return of everyone’s favorite zombie-themed TV show is set for October 2018. While Walking Dead fans are still discussing the cliffhanger that closed the last season, the rest of the world wonders how Angela Kang is going to handle things in the new season. According to the new chief content officer and previous showrunner Scott Gimple, the promotion of show writer Kang to showrunner won’t be a drastic change. Where will the story pick up from? Season 8 closed with Rick and Negan facing a showdown, and while the speculation that Andrew Lincoln is leaving the show turned out to be true, sources say Lincoln won’t exit until halfway through the season. The promotional poster for the ninth season teases a lot of things, like an expected time-jump and also a different location. While we followed the main characters in the same place throughout the years, the new poster indicated that the group would end up in Washington D.C. The proof of the time-jump theory is supported by the absence of Maggie’s baby bump. What is a significant plot change? Apart from the Whisperers, there’s also speculation that the Commonwealth community will make an appearance, which means that the existing cities in the show will face some rivalry. The plot indicated disharmony among the existing communities despite the initial attempt of unity. While the primary focus will be on the members of Alexandria, it is expected that the focus will shift once Rick leaves the show. It’s also speculated that other communities will have more importance in the upcoming season. Who will take the lead once Rick is gone? The Walking Dead fans have their favorites, and given Rick’s inevitable departure, the question of the future leader arises. Recently, it’s been confirmed that the next lead character is Daryl, played by Norman Reedus. While Maggie’s departure is still not confirmed, many hope that Carol will take on a more critical role in the upcoming season, along with Daryl. There is also a new mysterious character named George, whose part in the story is still to be revealed, even though it’s still not confirmed whether he’s joining the cast for this season only. In any case, once Rick is gone, we’ll get to see the individual character development among the remaining characters in the group. It’s speculated that if she decides to stick around, Lauren Cohan will get the chance to be the new villain of the show. The poster also confirmed that Melissa McBride and Danai Gurira would reprise their roles as Carol Peletier and Michonne. While we’re still waiting to see whether Cohan, who plays Maggie, will sign on for Season 9, it was confirmed that Chandler Riggs wouldn’t be coming back as his character Carl Grimes is confirmed dead. The show teased the inclusion of the Whisperers, a radical group appearing in the comics known for their violent policies. As it is confirmed that Season 9 will feature this group, there’s speculation that their leader Alpha will take on the villain role. The Whisperers undertake extreme measures to ensure they stay alive while roaming among the undead. They’re known for covering their body in zombie blood to blend in. There’s also a theory that Rick will die fighting the leader of the Whisperers. What will become of our favorite characters in the new season and how will the change in production affect the ratings? Kang is optimistic, while some of the cast members are hinting that the location will impact the story more than expected. Cling on to your Walking Dead action figures and wait; The Walking Dead will be back this October. I’m definitely excited for the time jump and change of venue.